As if I needed an excuse to get crafty. Young House Love issued another seasonal Pinterest Challenge along with Bower Power, Sparkle Meets Pop and Red Bird Blue. (Links go to their projects!) I looked over some recent pins and landed on a not-so-seasonal decision for this weekend's project: Christmas present gift tags! For years I created a wrapping paper theme for each year (check them out here), but after seeing red in 2010, I decided to simplify matters and stock up on brown kraft paper from Staples. I was sold after spending $5 on a giant roll and bought two more for the next holiday season. So now the key is to jazz up the brown paper in different ways each year. Here's a pin I'm keeping on hand for future reference: making it look like mail. 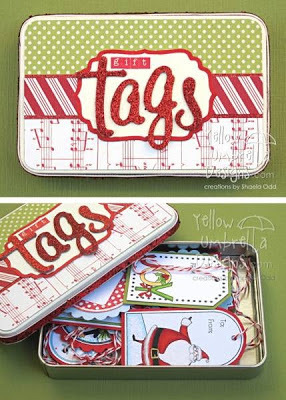 Speaking of red, a quick shot of the tags from 2010 - definitely heavy on the stamp ink usage! Two years ago, I created a set as a thank you gift for a friend, with generic tags, congratulations tags, birthday tags and more. This time around, I used this pin's comment to drive the project: "Old Christmas Cards"
A quick trip to Michael's stocked me up with tags of different shades and sizes. I decided to start out making 20 Christmas tags, with at least another 20 to make over a future weekend. 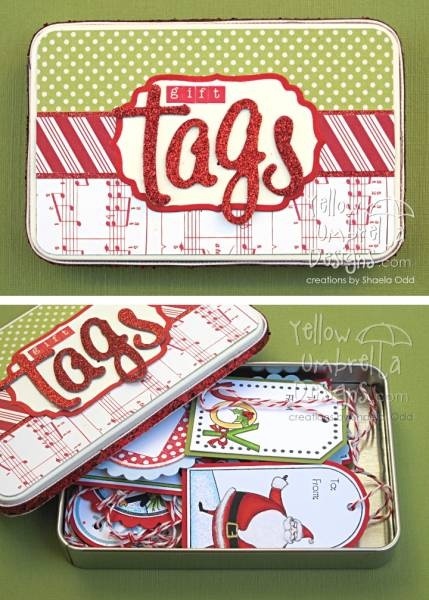 This still leaves another 40 tags to make non-holiday specific tags when the mood strikes! The toughest part of this project? Remembering what holiday bin I put the bag full of old cards! I save all Christmas cards and many have come in handy over the years for display purposes. It also allows me to cheat and look like I have A LOT more friends who all send their cards out by the first week of December! I sorted out the cards I couldn't bring myself to cut up, and then took to the scissors and glue dots with the ones that would make great tags. 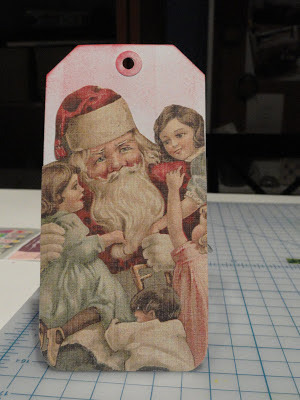 To highlight a few favorites, this one was cut out of a piece of scrapbook paper, trimmed to size and glued over a tag that was dabbed with cranberry colored stamp ink. A card that featured stand up reindeer when opened came in handy when I cut them out individually! 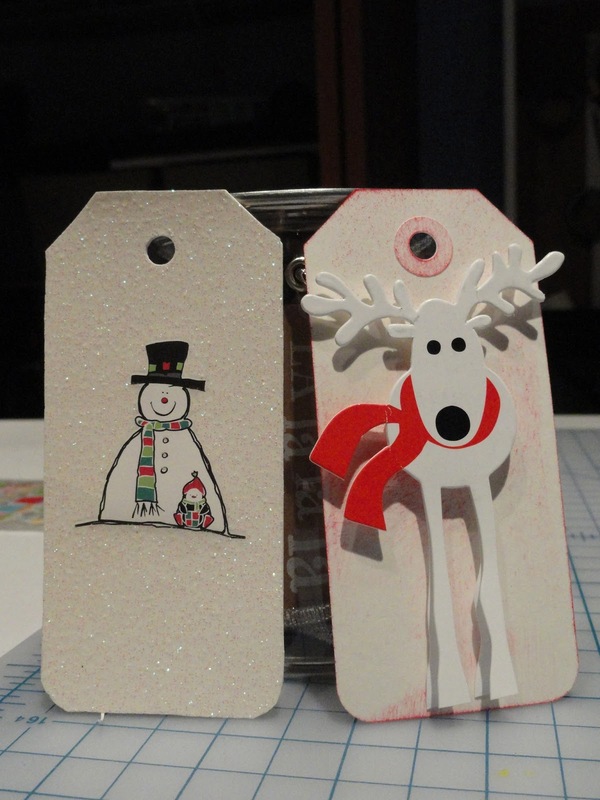 There were more than a few tags like this snowman one that I covered completely with the card's design. One hole punch later and it was done-zo. 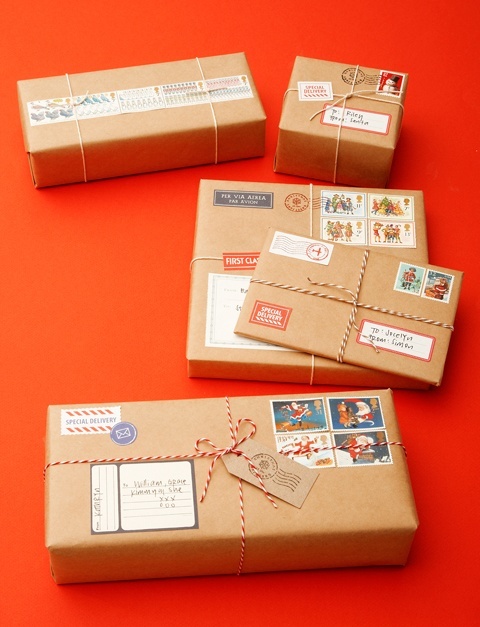 A few 3D elements were created with cards, stickers and raised double sided tape squares. Another pin helped me solve the issue of where to store these new tags. I ended up repurposing a tin that previously held a set of alphabet stamps I never use. The stamps got downgraded to a ziploc baggie and the tin got a facelift with scrapbook paper and some leftover letters from my Every Holiday Blocks. The perfect size, with room for a few more - looks like "Tags 2: Electric Tagaloo" will be coming to a weekend near me soon. 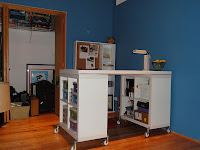 On another note, we built the project table and I took over the second bedroom in order to avoid making the couch the craft workstation - I kept losing things between the cushions. Yet, there is one thing I can't seem to avoid even with a dedicated space: "helpful" cats! Okay, that's enough cat pictures for one post. What projects are you working on months ahead of time? Does reading this make you want to pop in National Lampoon's Christmas Vacation like I almost did? Lovely! I love the 3D effect too! My mom and I used to do something similar to this as a girl. 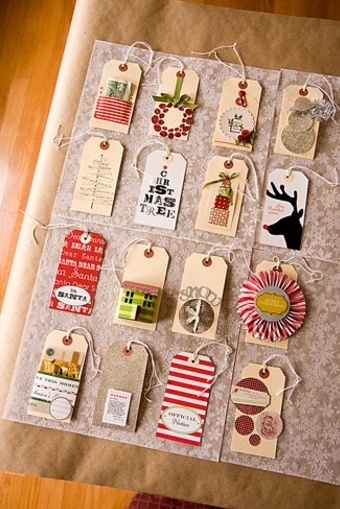 So many pretty Christmas cards that next year turned into great tags! We didn't have a fancy Tag box tho!